Recently, CareerBuilder conducted a nationwide survey involving 3,211 participants across different industries. These individuals were questioned about their current workload and their corresponding levels of anxiety. In total, 60% of workers reported feeling stressed in their current positions, and 11% reported feeling “highly stressed”. 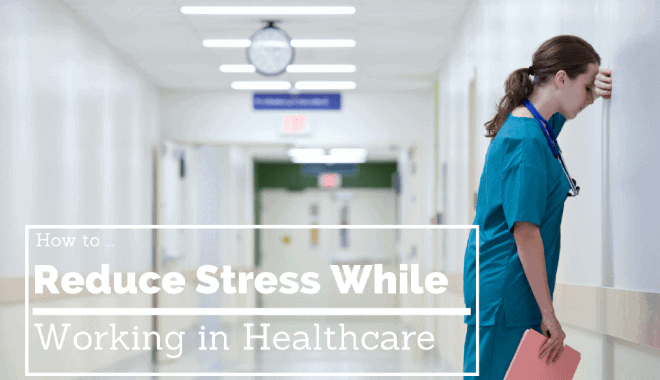 Those who worked in healthcare reported feeling the highest levels of stress. 69% reported feeling stress, while 17% reported feeling highly stressed. More than half reported that their workloads had increased in the last year. Keeping yourself and your workspace organized will help decrease the levels of stress you experience. Many individuals in the healthcare profession adopt the mindset where they feel as though they must be superheroes, but they simply are not capable of doing everything. By creating a time to establish your priorities for the day, you will be better equipped to formulate plans on how to complete everything. Being organized helps you to establish what it is you need to do. While you will not always be able to accomplish everything, being organized will assist you in prioritizing what must be done. The single most effective method of improving your mental and physical health is to dedicate time in your schedule to exercising. One 2013 study discovered that rats who did or were forced to exercise made themselves more resilient to stress than those who did not. The rats who exercised also showed quicker understanding and more adaptability towards new tasks or changes in routine. Likewise, similar research has demonstrated that meditation is effective in reducing feelings of anxiety or depression. Removing yourself from your own head is one of the best methods of overcoming anxiety in the moment. Anyone who works in the healthcare profession knows how important it is for the human body to get an adequate night’s rest; however, it is advice that is oft ignored in favor of other things. Yet, not getting enough sleep leads to lack of focus, fatigue, feelings of anxiety, and an overall poorer outlook and quality of mind. Sleeping an entire eight hours each night will refresh your worn down mind and body. If feelings of stress or anxiety are preventing you from sleeping each night, it would be worth your while to discuss your difficulties with an objective medical professional. Research has demonstrated, multiple times, how important it is to spend time in nature – even if it is simply visiting a green park. Not only does spending time outdoors reduce depression and anxiety, it also boosts creativity and focus. Experts recommend spending a minimum of 15 to 30 minutes each day in fresh air. Compassion fatigue is something that can strike any healthcare worker at any time. It is defined as stress that results from caring too much. Because most healthcare workers care deeply for their patients, listening to repeated stories of pain, fear, and anxiety will often produce similar emotions in the caregiver. Drug therapy is often most effective at treating compassion fatigue. Therapy also helps. Meditation, yoga, and breathing exercises can also offer relief. Other strategies for dealing with compassion fatigue include participating in charitable and community events, using therapy to learn how to banish feelings of guilt and self-blame, and increasing the amount of social support in your life. Healthcare workers face many situations each day that are often out of their control, like staffing difficulties and policy changes. By ensuring that they are organized, investing in their own mental and physical health, and sharing concerns with trusted friends, coworkers, or professional therapists, these workers will be better equipped to cope with stressors, which results in better patient care and increased feelings of personal and job satisfaction.